Learn to sail in one weekend. 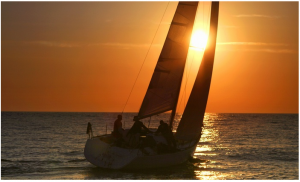 Classroom activities with an experienced sailing instructor includes sailing theory, terminology, and rules of the road. On water instruction includes rigging, safety, tacking, jibing, docking and navigating in light and moderate winds. Course spans two days and includes an American Sailing Association textbook. Sails launch from Cape Charles harbor. Note: So sorry! We cannot offer this option in 2018 – maybe next year!